The 2010 Americans with Disabilities Act (ADA) standards for accessible design requires that all playgrounds be designed and constructed in such a manner that the equipment is readily accessible and usable by individuals with disabilities. 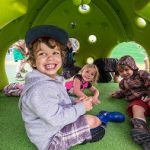 We’ve been meeting the ADA requirements long before they existed, and have since created playground components that address physical disabilities in addition to autism, sensory disorders, vision impairments and much more! National Parks and Recreation Conference!